Oregon scored just 20 points vs. Ohio State -- an inordinate amount for an offense that averaged 45.4 in 2014. ARLINGTON, Texas -- Twenty points. Oregon managed just twenty points. That’s all the Ducks and their Heisman Trophy-winning quarterback Marcus Mariota could muster against Ohio State in the inaugural College Football Playoff championship game on Monday night. Ohio State survived four turnovers and beat Oregon at its own game in a dominant 42-20 win at Jerry World. As a different Jerry -- Seinfield -- once said, it was more like “Bizarro World” for the Ducks. Nothing made sense for the Oregon offense after its first drive, which saw the Ducks drive 75 yards in 11 plays to take a 7-0 lead on the game’s first possession. The key? They didn’t let the yard-marker hit third down. Probably a good idea, because when it did -- oof. It wasn’t pretty. “Third down was a big deal, and part of that was precipitated by not being great on first and second down and getting in some third and longs which is not where you want to be against any defense along the lines of those guys,” Oregon head coach Mark Helfrich said. It took until late in the second quarter for the Ducks to convert a third down opportunity. They entered as the nation’s fourth-best team -- right behind Ohio State -- converting third downs at a 52-percent clip. So naturally the Ducks came out and misfired on their first five and were stuffed on a fourth and goal inside the 1-yard line. By the time the nation’s third-best offense did convert, they trailed by two touchdowns thanks to an unstoppable Buckeye offense and finished just 2-for-12 on third down. “If you're in third and mediums, third and shorts, you've got a lot more options and a lot more things that they have to defend, and we were in a ton of third and six pluses, seven pluses that allows them to get after you up front and be a little bit more diverse in their coverage, so it's always kind of a combination of all those things,” Helfrich said. Between injury and suspension, much was made about the playmakers Oregon didn’t have in uniform Monday night. The mantra was “Next Man Up” because that’s what got them here. Darren Carrington, Pharaoh Brown, Devon Allen. They weren’t on the field. And almost right away, it was painfully obvious to those clad in green and yellow. In what was supposed to be a high-scoring track meet, Oregon was looking to answer the Buckeyes’ game-tying score in the first quarter with another score of its own. There was wide receiver Dwayne Stanford all by himself behind the Ohio State secondary on third and 13. Clank. Mariota’s perfect pass somehow fell incomplete. It wasn’t the end of the world. At least until Ohio State took us into Bizarro World. A world where, instead of Oregon’s opponents constantly seeing things snowball (ahem, Rose Bowl), it was Ohio State rolling a fist full of snow down the four levels of AT&T Stadium. And in case you haven’t been here, that’s a lot of time for it to grow into a massive problem. 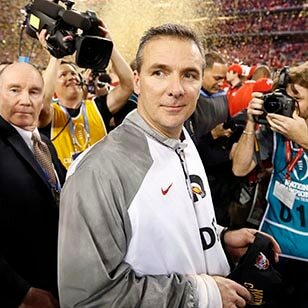 “We slowed that guy down, and [Mariota] one of the best players in the country,” Ohio State head coach Urban Meyer said. “We tackled well. This is a heck of a football team in scarlet and gray and I want to celebrate with the guys I love." And it could’ve been a lot worse, scoreboard-wise. That’s tough to say in a three-touchdown game but if not for four Ohio State turnovers in Oregon territory … yeah, you get the point. It was the first time in Helfrich’s career the Ducks lost a game when it won the turnover battle (17-1), and the first time in his career he’d lost when they scored first (15-1). Ohio State’s balanced attack ate away at the Oregon defense to the tune of 538 total yards, including 246 yards on the ground by running back Ezekiel Elliott. That was supposed to be Oregon’s lethal attack. Falling behind by two scores in the first half, combined with an incredible performance by the Ohio State front seven, forced Oregon away from its usual plan of complimenting Mariota with its stable of running backs. On this night, Thomas Tyner and Royce Freeman were held to just 84 yards on 22 carries. Nearly 1.5 yards less per carry than their season average. When you’re in Bizarro World, things are just plain weird. So much so, that on the game’s final play and trailing by 22 points, Mariota threw what was likely his final collegiate pass. The meaningless toss was intercepted -- just the fourth he’d thrown all season on his 435th pass attempt. Without the pick, Mariota would own the single-season record for best interception percentage, but Kellen Moore’s 0.7-percent from 2009 still sits at the top of the record book because Mariota finishes at 0.9-percent. Of course. He finished the game with 333 passing yards to become the first player in Pac-12 history to reach 5,000 yards of total offense in a season, albeit in 15 games. Jerry Seinfeld said it best: “Yeah, like Bizarro Superman, Superman's exact opposite, who lives in the backwards Bizarro World. Up is down, down is up, he says hello when he leaves, goodbye when he arrives." Up was down for the Ducks on this night … in this world.